At some point, someone has probably told you to be careful what you wish for. And if you had oily skin as a teenager, you may have wished it away, only to have dry skin plague you as you age. While dry skin has the benefit of not causing you to break out before a first date, it can be just as frustrating as acne-prone skin. In fact, it can even be more painful. The good news is that it's often much easier to address. 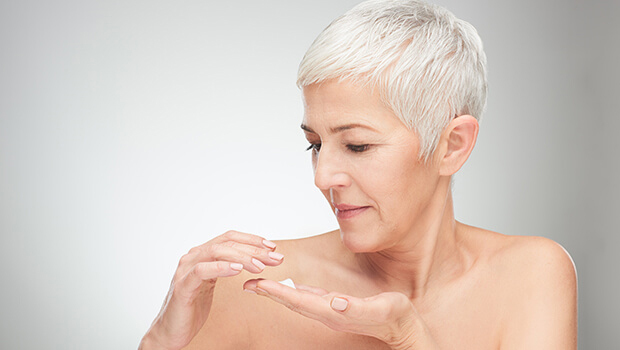 Dry skin can be the result of a dermatologic disease. So if yours is severe, you should have it checked out by a doctor. But mild redness and itchiness may just be a result of aging. It's important to keep your skin hydrated. Dry skin is not only uncomfortable, it can lead to cracking that lets toxins into the body. Well-hydrated skin helps keep dangerous germs on the outside. The skin's moisture level depends heavily on a layer of lipids. These lipids help trap water in the skin. As we age, this layer may not work as effectively. You can't turn back the clock, but you can offer your skin some help. With the right products, you can actually attract moisture to the skin. One of the best ingredients for this is hyaluronic acid. You'll find hyaluronic acid along with anti-aging peptides and botanicals in the Système 41 Night Treatment. As you sleep, this product provides intense repair to your skin. It can help close up the cracks and smooth the scales. This will not only provide relief but also keep you safer from external toxins. If only acne had been this easy to deal with!